1. the ovum within the graafian follicle. 2. any small, egglike structure. 1. The oocyte of a mammal, especially while still in the ovarian follicle. 2. A small beadlike structure bearing a fancied resemblance to an ovule. 1. the oocyte within the graafian follicle. 1. Botany A structure in seed plants that consists of the embryo sac surrounded by the nucellus and one or two integuments and that develops into a seed after it is fertilized. 2. Zoology A small or immature ovum. ov′u·lar (ŏv′yə-lər, ō′vyə-), ov′u·lar′y (-lĕr′ē) adj. 1. The oocyte (ovum) of a mammal, especially while still in the ovarian follicle. 2. A small beadlike structure resembling an ovule. Fig. 241 Ovule . General structure. a structure found in higher plants that contains an egg cell and develops into a seed after FERTILIZATION. In ANGIOSPERMS, the ovule develops within the ovary of a carpel, and consists of an inner EMBRYO SAC containing the egg cell surrounded by the NUCELLUS, which in turn is enclosed within two INTEGUMENTS. 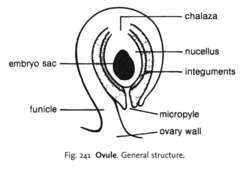 The ovule is connected to the ovary wall by the FUNICLE. alata confirms the statement of Tokuoka and Tobe (2003) that the ovules of the subtribe Dalechampiinae, including Dalechampia, presents a vascularized outer integument, which is unknown in the subtribes Plukenetiinae and Trigiinae. Ovules and young seeds of the analyzed species maintain the structural pattern observed in Asteraceae (Compositae) (CORNER, 1976). But, male and female flowers which are morphologically and anatomically identical, especially in the characteristics of the ovary and ovules, as occurs in C.
In contrast to these passive models of pollen uptake, more active roles for the ovule have been proposed. Flower samples were collected daily from the first to the twentieth day after pollination to evaluate the ovule size (diameter) using a stereo microscope. Each pod bears an average of 18 to 19 ovules from which more than half can be expected to initiate seeds (Haddock and Chaplin, 1982; Petersen and Wang, 2006). Because the developmental stage of pistils and pollen is critical, pollen tube emergence is usually seen in about 60-70% of the pistil/ ovule units that were placed on the plates. The dinoprostone ovule was removed if the fetal heart rate pattern did not return to normal limits in spite of supplemental oxygen given by nasal cannula or facemask. Once there, the pollen grains can fertilize the ovules, or plant eggs, tucked inside. She compared (he American system with the tort system in Britain, finding that rulings on claims there pi ovule reparations, deterrance and emotional vindication In America "she said, there is no established system for airing grievances, besides the courtroom; while in Britain there is a medical ombudsman and other forms of outlet, which, she said, respond In addition, malpractice claim cases don't go before the jury and there is no contingent fee set up. Two hundred eighteen postmenopausal women were randomized to receive a daily ovule of placebo or 3. They cover carpel evolution, genoecium patterning in Arabidopsis, the ins and outs of ovule development, fertilization and fruit initiation, Arabidopsis fruit development, long-distance seed dispersal, seed dispersal and crop domestication, factors influencing the ripening and quality of fleshy fruits, and parthenocarpy in crop plants.